This quatrain isn't entirely unremarkable. We kind of like how lines 1 & 2 are tied together by the alliteration of "great" and "good" just as 3 & 4 are linked by "yours" and "year." Even more, we like how those alliterative couplets get broken by the rhyme of "cheer" and "year" between lines 2 & 4—an abcb rhyming pattern that makes us think of the common measure of many hymns, which is quite appropriate given the season's religious orientation. 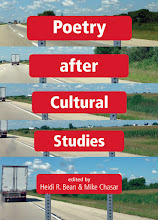 Nevertheless, the poem left us definitely underwhelmed—not a very common experience here at "Poetry & Popular Culture." All of this made me think of Robert Frost and printer Joseph Blumenthal. For nearly 30 years (from 1935 to 1962, at least), Frost and Blumenthal partnered up to produce finely-printed, delicately-illustrated Christmas cards featuring Frost's poetry, such as the 1961 card pictured to the left. Blumenthal, who ran the Spiral Press of New York from 1926 to 1971—the press for which the typeface now known as Emerson was first designed—made it a practice to work with well-known writers such as W.H. Auden, Pablo Neruda, William Carlos Williams, Robinson Jeffers and Franklin Roosevelt. So it was with Frost, though it's probably more accurate to call the Frost-Blumenthal productions holiday "greetings" rather than "cards," since many of them were in fact small, saddle-stapled chapbooks and not cards as such. Some of the greetings reprinted well-known poems such as "The Wood-Pile" (which first appeared, in book form, in North of Boston ) but many others purported to present "a new poem by Robert Frost." This performance of newness—the unveiling of a new poem just in time for Christmas—must have appealed to the people who bought the cards & sent them out, the patrons of Spiral Press and thus patrons of Frost. For not only did Frost send them to his own friends and family, and not only did Blumenthal send them to express his season's greetings, but the Spiral Press printed them for other parties as well. As you can see from the greeting page to the left, Blumenthal left space so he could personalize each card—here in a different color ink—which was no doubt a major selling point for the consumer, who could claim in a roundabout way partial responsibility for the poem's coming-into-being. Spiral Press worked with a number of artists over the years, each of whom produced designs that go beautifully with Frost's work despite the frequent disconnection of those designs from overtly seasonal themes (see the very cool atomic motif decorating the cover of "Some Science Fiction" to the left, for example). Nowadays the cards are collectors' items you can find on eBay and elsewhere—$25 a pop for some, up to $500 for others that have been signed. We here at "Poetry & Popular Culture" have seen our fair share of them thanks to the nice collection housed in the Special Collections division of the University of Iowa's Libraries. We look forward to piecing together a more complete history of the cards. Who initiated the collaboration? What was the annual press run? Did the press have a list of subscribers committed to buying a set every year, and how much money did Blumenthal and Frost eventually make off of the limited editions? There is a special link between Frost and Christmas in the American mind, one that Frost and his publishers weren't afraid to play up. Take, for example, Frost's Snow to Snow, a 1936 chapbook issued by Henry Holt & Company which presents twelve of Frost's well-known verses, each one corresponding to a month of the year and ending with December's Christmassy "Stopping By Woods on a Snowy Evening." The singular importance of "Stopping By Woods" is established by a facsimile of the handwritten manuscript placed prior to the table of contents. Thus, while the book ends in Christmas, it also begins there as well. Did Frost write with the potential marketability of Christmas-related items in mind? The poem "Christmas Trees"—first printed in Mountain Interval (1920) and four years later on the broadside seen just above—suggests maybe so. Interestingly, this broadside version of "Christmas Trees" leaves off the subtitle that Frost appended to the poem: "A Christmas Circular Letter." Indeed, while he may not have been thinking of Christmas cards as early as 1920, this subtitle suggests he was well aware of the special communicative moment that holiday greetings might afford a poet who remained open to its possibilities.